With all the interest in low cost Serial ATA RAID systems, it's easy to overlook some impressive alternatives. 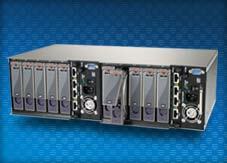 Medea Corporation has solid experience creating video RAID systems with guaranteed performance and reliabiity. I asked to test their 2 Gigabit FCR2X Dual Channel Fibre Channel VideoRAID system. It consists of two banks of 5 drives that are configured as RAID 3 in the box (4 drives striped plus one for parity). This is a key element since it insures that the failure of one drive won't affect the integrity of the data. You just replace the bad drive and continue to "rock and roll." You have the choice to either stripe or mirror the two banks of drives using Apple RAID or SoftRAID. I chose to stripe the two banks since I wanted to see if that setup would meet or exceed the tartget speed of 237 megabytes per second required for Uncompressed 10 bit RGB (4:4:4) 1080/60i. What good is reliability if you can't capture or playback HD video without dropping frames? Of course, you need a Fibre Channel PCI host adapter to "drive" the box. We tested the VideoRAID with two different Fibre Channel host adapters: the ATTO Celerity FC-22XH and the Apple Fibre Channel PCI-X. They are both rated at 2 gigabits per channel, which translates to 400 megabytes per second per channel, assuming no bottlenecks or overhead. Let's get right to the results. The first two graphs are results from the Blackmagic Design's Speed Test, which ships with each DeckLink HD capture card. It's useful for rating your storage system's ability to capture or playback High Definition footage. It can be slightly misleading since the test is done on an empty volume and therefore the fastest portion of the volume. For a dose of reality, what really needs to be tested is the last 10% of a RAID set. Do to an unknown error, I wasn't able to partition the VideoRAID with SoftRAID. So instead, I used DiskTester's area test to test various zones on the volume. I chose a 5GB test file and 128MB transfer size. Note how the speed of the SATA RAID drops compared to the Blackmagic test while the Medea VideoRAID holds steady above the target speed. Though the Medea Fibre Channel VideoRAID didn't attain the 475+MB/s observed on recent 8 drive Serial ATA RAID 0 setups we recently tested, it did achieve speeds far above the required 237MB/s for Uncompressed 10 bit RGB (4:4:4) 1080/60i. Even at 90% capacity, it stayed above the target speed. Impressive for a "self repairing" RAID system. Speed isn't everything. What good is a perfect capture session if you lose all your data due to a drive gone south? In a perfect world, we want speed and reliability. That's what Medea offers with their VideoRAID systems. Though a home built 8 drive SATA storage system may cost less and go faster (when empty), it doesn't offer the security of the Medea systems. And with Fibre channel, you need only two cables for 10 drives instead of SATA's one cable per drive. In July, we're looking forward to testing the next generation 4 gigabit Fibre Channel storage system from Medea rated at 800MB/s per channel. So stay tuned. For some reason, the ATTO FC-22XH gave us data transfer errors when we used copper cables, whereas the Apple Fibre Channel card worked fine. Medea suggests optical cables if you plan to use the ATTO board. ATTO will be loaning us their new FC-44ES 4 gigabit Fibre Channel host adapter when we test the new 4 gigabit box from Medea, so we'll get to see if it works reliabily with copper cables. Native Fibre Channel drives do exist. Seagate has been making them since 1997. However, Medea uses "plain old" parallel ATA-100 drives which connect to a special bridgeboard that converts them to Fibre Channel. The bridge board or raid controller is removable, which makes it easy to convert the VideoRAID enclosure to Ultra SCSI if you so desire. We were able to use our ATTO UL4D Ultra320 SCSI host adapter with the Medea VideoRAID by simply changing the bridgeboards. In our brief testing the speed was basically the same. BareFeats review of the Sonnet Tempo-X eSATA 8 PCI-X host adapter with an 8 drive SATA RAID 0 set. BareFeats review of the FirmTek SeriTek/1VE4 PCI-X SATA host adpater with 4 and 8 drive SATA RAID 0 sets. StorageReview's discussion on RAID 3 and other types of Reduntant Arrays of Independent Disks (RAID). Another article on ACNC explaining RAID with cool diagrams of each type of RAID. 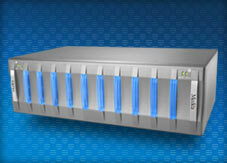 Yet another article on RAID at SearchStorage.TechTarget.